This month and next month, I look at distribution from a customer service perspective. Yes - the DC is a critical link to customer satisfaction (or dissatisfaction) and this article will tell you why. The video of the month looks at an innovative new type of AS/RS system that uses portable shelving units and AGVs. My operations spotlight covers the first of a two part series on void fill options. Finally, I look at methods for storing large numbers of pallets for a single SKU compactly and inexpensively. JUST 1 1/2 WEEKS AWAY! At 2wmc, we are experts in helping our clients save money. We do this by helping clients select solutions that meet their specific needs. 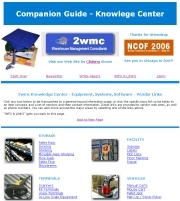 Unlike many systems and equipment providers, including some who call themselves consultants, 2wmc has nothing to sell you other than our experience. We work exclusively for you and represent no other system or equipment provider. This month we look at the distribution center from a customer service perspective. Companies with the highest levels of customer satisfaction always carry their goal of customer service perfection into the distribution center. It is too easy to think of the distribution operation as an operation completely separated from the customer, and companies that do this do so at their own peril. We look at 5 common failures this month and 5 more next month. There is nothing more frustrating than having to wait for weeks to have a problem fixed. I had the experience of receiving a damaged product, and then being required to return a product before the company would ship me a replacement. This added weeks to the original delivery time, and I still remember it now 3 years later. With the pressure to provide free shipping, many operations try to put as much as they can in a single box. I recently ordered a bunch of books, and found them thrown in a box with no cushioning, and the lightweight box and tape didn’t hold up well on the trip. Corners of my new books were bent and the box was nearly burst open when I received it. Make sure that you don’t over-do it, and also be sure not to mix incompatible items such as heavy and fragile items, without proper protection. You may have to bite the bullet and pay for an extra package, or put a package within a package to provide better protection in transit. Talk to your carrier about their policy for discounts for multiple boxes to a single address on a single day. Some items may be loose or poorly protected in the packaging received from your supplier. The lack of good vendor packaging may result in product damage during shipment, or simply give a bad impression. Either ask for changes from your supplier, or perform a value added function to improve the packaging of these items yourself. For example, you might spend the time to fold, bag, and label a shirt to demonstrate to the customer the inherent value of the product. There is no better way to anger a customer than to send them a product that is expired, almost expired, one that has diminished in quality, or one that is no longer the most recent version. Care should be taken both in inventory control, and in verification of items prior to shipping to prevent old or obsolete product from being accidentally shipped. If you have items that are sensitive to heat/cold, consider ways to protect them better in storage, or eliminate them from your offerings. Nowadays your competition may send 4 or more emails telling the customer the status of the order. Companies that don’t communicate what is happening with a customer’s order aren’t playing any longer on a level playing field. In particular, you should be able to update the customer on a tracking number, and on any exceptions or problems that occur on the order. 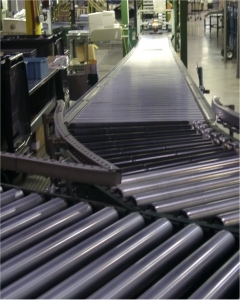 This month, we will look at a new twist on AS/RS (Automated Storage and Retrieval) systems. The system shown in this month’s video brings shelving units to the picker, rather than having the picker travel to the shelving unit. The system uses a technology called Mini-AGV (Automatic Guided Vehicles). What makes this system unique is that it is both flexible and expandable, and expansion can be done gradually. 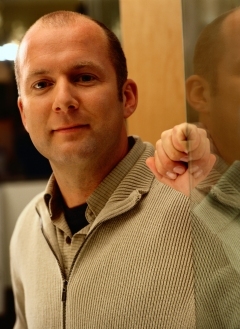 Most AS/RS systems are limited to a specific throughput once they are deployed. 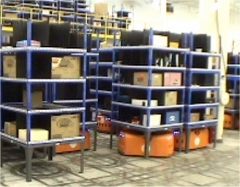 This system allows increases in throughput to be achieved through the addition of more mini-AGV units. Additional storage can also be added in any quantity at any time through the purchase and deployment of more shelving units. The mini-AGV’s are battery powered and one unit can “rest and recharge” while others continue working, making it possible to have a perpetual 3-shift operation. Another neat feature is that replenishment and picking can be done concurrently using the same set of AGVs, but at different physical stations. If your business grows, you just need to add more pick stations, more storage, and more mini-AGVs. 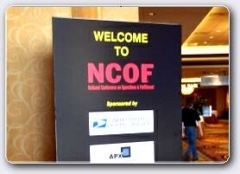 Note: Material covered in this article will be presented in much greater detail in my talk at the NCOF, The Last 100 Yards, Monday April 30th at 1:45 pm (click here for complete details and a link to the conference site). In our operations spotlight, we begin a series on how to pack and fill the void before shipping out a package. Many different types of fill and void fill equipment have been introduced over the past 20 years. We will proceed chronologically, starting with some of the systems that have been around the longest, and proceeding to the most modern systems commonly available. 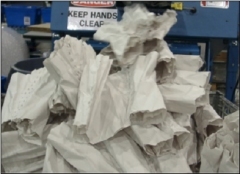 Hand Crumpled Paper - Hand crumpled paper has been with us as the “original” packing material, and it probably began with the invention of newspaper. Today, companies provide flat sheets of craft paper in different thicknesses and this paper can be crumpled and fit to fill a void. It is one of the slowest of all void systems, but it can be used effectively to pack almost any type of material. Like all paper solutions, the longer distance that your packages travel, the more the paper will tend to matt down, and the less protective capacity it will have. Machine Created Paper Pads - Paper pads were one of the first automated paper solutions. 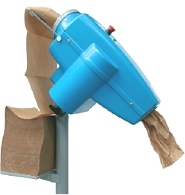 Pads can be created to specific lengths and can be filled to a reservoir or created on demand. If you have only a couple of different shipping container sizes, pre-cut pads can work well. Pads can also be used for variable sized boxes, just by throwing in the pads as you would any crumpled paper. Continuous Flow Paper - Continuous stream paper is an alternative to paper pads. Several different types of machines are now available ranging from a single workstation system to very high-speed in-line systems. 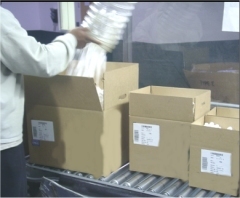 A neat feature of continuous stream systems is that paper can be utilized to wrap items as it is dispensed, and can also be directed to fill specific voids in containers as it is dispensed. Peanuts - Peanuts are terrific cushioning material. The problem is that most customers hate the mess that they make, and some customers don’t like any type of non-biodegradable product. Styrofoam peanuts have superior cushioning capacity and are very light. Peanuts can also be purchased that are made of starch. The starch peanuts have less cushioning capability and can matt down more than Styrofoam, but they are 100% biodegradable. Starch peanuts may get sticky in hot humid weather, so they may not be ideal if they are stored for a long period of time. They also may create pest problems since they are an edible material. 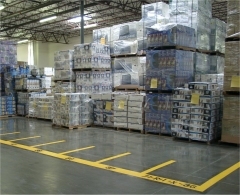 Are you thinking about adding to your existing pallet storage? If you have large numbers of pallets for a single SKU, there are a number of alternatives to traditional selective pallet rack that you may want to consider. This month, I’ll detail some things you should look at prior to spending money to add more pallet rack storage. The systems described in this article work best for on-hand pallet quantities of 10 or more pallets per SKU. If you have large numbers pallets that come and go in an unpredictable manner or in a seasonal pattern, you may want to consider dense floor storage alternatives to traditional rack storage. Floor storage is the topic for this month. Next month, we will look at deep rack storage alternatives. Block Floor Storage: By far the cheapest of the alternatives, this strategy is great for creating very high density in a very small space. 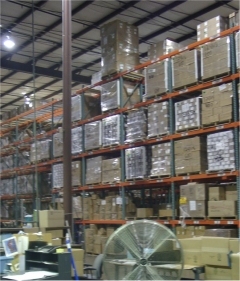 If you can safely stack your product 3 or 4 pallets high, it can be the cheapest and densest of any alternative. The key is that you must manage your stock, keep in well organized in rows, and if FIFO is important, you must pick lanes clean before putting away newly received pallets. More likely, you may have a situation where you can stack only 2 pallets safely. 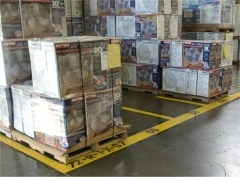 In that case you will need to consider the purchase of equipment to safely stack pallets on the floor. Stacking Frames: Stacking frames eliminate the problem of stacking height by using a rigid frame that can support loads that could not otherwise be stacked. Stacking frames are completely portable and can be set up in a matter of minutes. 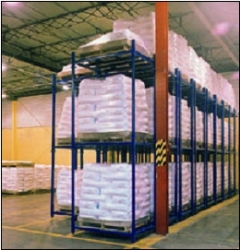 Another advantage of stacking frames is that they can be used to stack loads that are not flat or level on the top. Stacking frames can be moved to any floor location and can be taken away and stored flat (or even outside) when not in use, so that they are great for occasional large or seasonal receipts.